It's October 30th and we woke to feel a chill in the air for the first time today. There have been a few thunderstorms. It is lovely watching the rain over the Mediterranean (between the buildings). In Arabic winter = rain. Female Emirates Air flight attendants and ticket staff wear hats with a thin scarf sewn in that drapes down one side, covering less than half of the head and neck, but offering a significant nod to traditional Islamic custom. It does look a bit odd. I note the disgusting cloak of air pollution enveloping Bierut as we jet off into the Mediterranean. We fly over Syria, the northeast corner of Jordan, and Saudi Arabia along its border with Iraq. There are no clouds and I can see desert, desert, desert below. Then, into the Gulf, past Bahrain and Qatar,and then Dubai (all this thanks to the inflight maps on screen) where I will have a long layover before boarding another Emirates flight to India. The water of the Gulf gives way to...skyscrapers, oddly placed, next to each other but not near, with space all around. The skyscrapers give way to low, flat warehouses, in neat rows, separated by freeways. There is the first cloverleaf exchange I have seen since I-5. And there, a 10 or 12 lane freeway with some traffic--hard to imagine how it could fill with cars in this substantial, but sparse city. And there, a perfectly straight 2 lane road with neat, dotted lines, taking off into the desert, no cars. And a few large houses in compounds, with--oh my--swimming pools. What did this place look like before oil became the lifeblood of civilization? 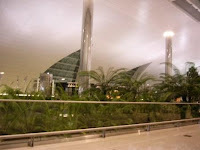 Dubai airport. Wow. Photo is the foliage surrounding the “water feature” I had previously noted on the airport website in preparation for my 13 hour layover here. I take advanta ge of free internet and the free dinner offered by Emirates Air. I am there through three calls to prayer, broadcast over the PA. There are large duty free shops, fancy lounges, restaurants, a spa, and free lounge chairs for those of us needing to get a nap in. My first hint of India is the scent of sandalwood on the airplane, emanating from some saried ladies. The plane is packed. I learn that 47% of everyone in Dubai is actually Indian. 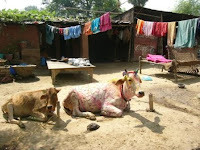 The city of Calcutta has 14 ½ million people—more than three times the entire population of Lebanon. I see and feel Calcutta's lush tropical climate as I disembark, but note that the airport arrival hall sports fake plants. Cam is not at the airport to meet me. I manage. “Is it Wednesday already?” he says when we meet. The traffic is scarier than Beirut—and that is saying a lot! People e v e r y w h e r e, simple lives—no, not simple, but basic. There are so many people, and so much noise. 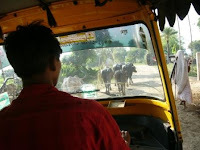 Constant honking, for one thing: the yellow Ambassador taxis, the three-wheeled autorickshaws, the bicycle powered rickshaws, all honk. There are not so many private cars. The streets are clogged with people and vehicles. Mother Teresa’s. 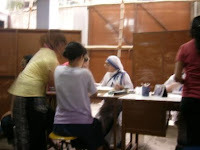 [photos show Mother House", where the day's volunteers gather, and a nun registering volunteers] More than 60 volunteers from many different countries are here this morning to work. I spot Canadians, French, Japanese. The day starts at 6 am with mass. We intended to be there and I rose at 4:45 to check out of my hotel and meet Cam by 5:3o, but the outside gate to his hostel is locked, and after 10 minutes I succeed in rousing someone there, but then, up the three flights to the place, it’s gate is locked as well. He finally hears me calling from outside the gate (what a hideous fire trap!) but then it takes half an hour to rouse the man with the key to it. So we miss mass, but arrive in time for tea and bread, then head off to one of several work sites. 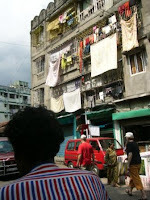 Our is a 20 minute walk through increasingly poor areas, lined with open sewage troughs, people sleeping everywhere, people walking everywhere, so many people, through a particularly dilapidated shanty town alongside railroad tracks. 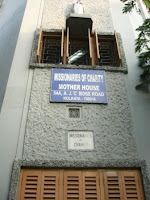 Mother Teresa’s Centre for the Sick and Dying is a remarkable oasis here. 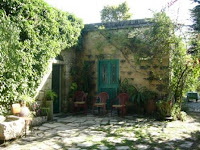 There is a garden and shaded seating areas around the buildings. A chalkboard inside reads: October, Admitted 8, Released 2, Died 4, Total 178. By the time we leave several hours later the number admitted has risen to 10. I wonder how many they can take. 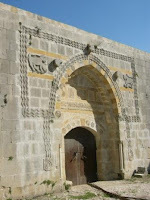 Men and women are in separate buildings. I wash, rinse and hang clothes, while Cam washes floors. We have a tea break after a couple of hours. I speak with a very nice Spanish lady from the Basque region; she asks me about Beirut and instantly relates to my comment that the media’s portrayal of it as a dangerous place to be does not jive so well with the day to day reality on the ground. After the break we help to serve lunch, feeding those who cannot feed themselves. In the women’s area some of the volunteers have brought massage oil or hand lotion, and we massage some of the ladies legs or feet, and make the beds. How do they manage the evening meal without all these volunteers, I wonder. A city view from a bicycle rickshaw ride. Later we head to the train station for an overnight train. There was a strike and it was hard to get a taxi, but in the end we arrive early and have three hours to wait. At 10:30 at night we are still sweating. The scene is a proverbial sea of humanity. A constant stream of people moving along and around the people sitting or sleeping on the floor. There are no seats. I buy a Hindi newspaper to have something to spread on the floor to sit on. Once on board, I discover to my dismay that the 2nd class sleeper does not come equipped with bedding. 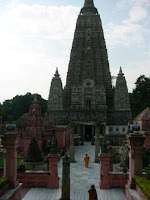 We survive and reach Bodhgaya, site of the bodhi tree where Buddha attained enlightenment. 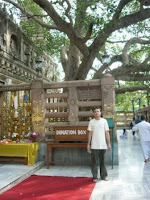 At right is the temple built next to the tree. 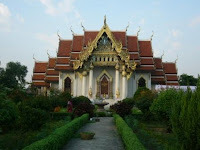 Devout Buddhists come from all ofer the world to see the place, and in addition to the large Mahabodhi Temple compound in which the tree sits, there are beautiful temple monasteries built by Thailand, Japan, Tibet, Bhutan, Burma (see a few photos below). 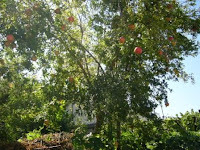 There are also meditation centers offering courses and retreats. Cam tells me around 10% of Indians are Buddhists. 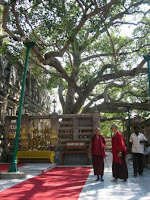 Here is the tree, with two Tibetan nuns. 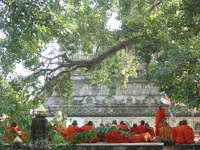 Another photo shows a group of monks listening to an abbot speak. 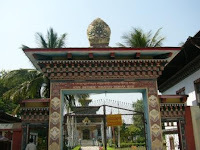 And the entrance to the Bhutanese monastery. But we have arrived on the first day of a major Hindu holiday—Diwali, the festival of lights. “Happy Diwali” people smile and greet us--so nice. In the evening one strolls around the town, admiring all the lights strung up and stopping by special shrines that have been set up for the occasion, often blaring music. The lights are for “brightness and joy with the hope of finding light in darkness, achieving knowledge where there is ignorance, and spreading love amidst hatred”—wow!. Our hotel room overlooks a Hindu temple where we get to watch and listen to live music one night (um, but ‘til past midnight, and beginning again the next morning at 6). 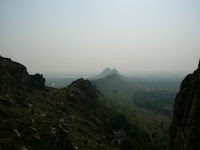 The next day we took a bone-rattling autorickshaw (= tuktuk = 3 wheeled, two seat, umpteen passenger vehicle) ride 20 some kilometers into the Bihar countryside to a cave where Buddha spent time fasting and meditating. 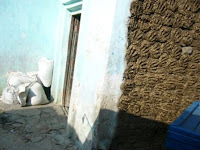 Along the way I spot dung patties set to dry on walls (see photo) and tree trunks, to be used for fuel, kids playing cricket, goats, dogs, rubbish heaps, and cows painted (mostly in purple) for Diwali. My fav sports pink plastic ribbon on each horn. Photo shows one with lovely pink and purple circles and a necklace. While we are on the subject of unmentionable items, there are lots of advertising signs for various brands of Male Innerwear (well, as opposed to outerwear of course). We leave the following day to return to Calcutta, on a train that will take all afternoon and night. It is almost two hours late arriving—not a good sign and I wonder if I will make my plane out the next day or not. We wait at the Gaya station with a whole community of people, some people apparently living on the platform, others just having a nap perhaps, on the waiting room floor. A small goat wanders by on the platform, a cow across the tracks. Photo shows train interior before it got crowded. Note ceiling fans. Another photo is of a train station along the way, at night, crowded with sleeping people. On board we enjoy snacks bought from vendors: chana (?) = sprouted grains with chopped onions, chili and a squeeze of fresh lime; gulfi (?) = cardamom and saffron flavored ice cream. (I was leery at first, to join Cam in all the street-prepared food he eats, but amazingly I suffered no intestinal issues the whole trip). A wave of humanity sweeps into and on top of the train at one stop. Five sit on a bench made for three, the aisles full, and Cam and I spend a few hours sharing our one two-person bench with four others. 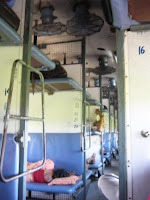 We were supposed to have had a sleeper with AC and bedding, but somehow have ended up with this second class car stuffed with people, fans whirring, few apparently, having reserved seats but us. By 11 pm the crowds have thinned and we are able to secure one bunk each. At 6 am the man in the bunk across from me is hawking and spitting out the window. There is a lot of spitting in India. 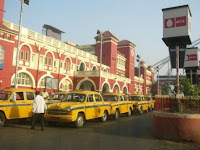 At 6:45 am we pull in to Calcutta’s colonial-era Howrah station (see photo), miraculously only three hours late, and in time for me to get to my plane if I dash. A much too sh ort goodbye with Cam, who helps me negotiate a taxi to the airport. It is hard to leave him there. 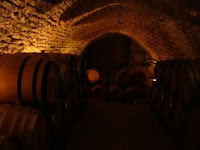 Tom put together a trip to three "boutique" wineries. 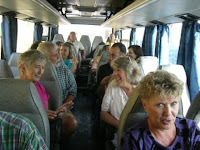 We went by hired bus to Chateau Belle Vue in Bhamdoun, just off the Damascus Highway in the hills above Beirut. 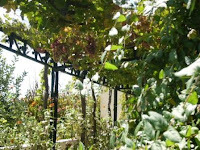 A Lebanese man and his American wife returned from the US to take over his grandfather's land, and started the small winery. 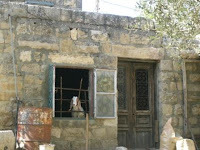 The wine is organic (they are actually going biodynamic--unheard of in Lebanon!!) 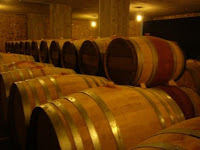 , has won a number of prizes in competitions in London and in France, and is pricier than most of our group of teachers were prepared to spend.. .
Hope you can make out a stash of their barrels, on the right. 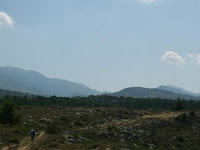 The bus broke down for awhile here, sigh, putting us off Tom's carefully planned schedule by close to an hour. 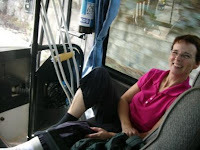 Intrepid wine connoisseur Sharon, above, who made the trip despite a broken leg. Next, at Domaine des Tourelles in Chtaura in the Bekaa Valley. Everyone's favorite, I think. 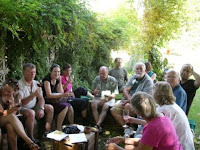 It is a lovely spot, a great tour of the wine making facilities, and excellent, affordable wine. A family run business (fourth generation!) 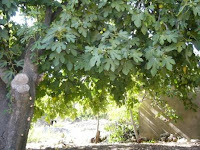 Domaine des Tourelles also makes one of the most famous Araks in Lebanon (Arak = think ouzo or raki). Originally made by Pierre Brun, they have kept up high standards of quality and use the best ingredients. 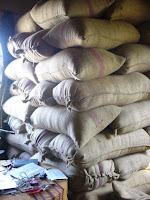 Below are sacks of anise seed imported from Syria. 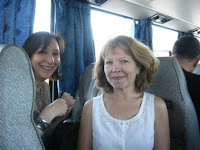 They had prepared a Lebanese mezze lunch for us (we could have ordered French cuisine--next time!) and we enjoyed the leisurely meal and tour of the place after. Another family run place, lunch was cooked by Mom. Awfully dark, but hope you can see the bottles piled high in the cave (that's cave, dears, rhymes with Toyota Rav). Back to Beirut way later than planned, due to horrendous, typical Sunday evening traffic trudging back into the city from all directions. 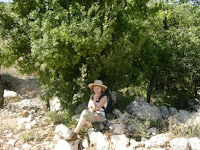 We went with our favorite hiking group on a 14 kilometer hike in the Shouf (mountains to the south and east of Beirut), to the village of Baadarane. 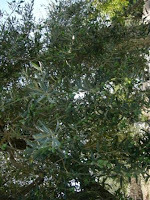 Your photographer is pretty lame, but perhaps you can make out some of the agricultural delights we saw on the way: pomegranate tree and olive tree below. Um, can't remember how old this building is, but for Americans just think REALLY OLD.